Ravens are birds that appear often in mythology. The Norse god Odin is said to have two ravens, Huginn and Muninn, representing thought and memory. In many cultures ravens are thought to carry the souls of the dead to the next life or be the ghosts of those who have been murdered. In Celtic mythology the Morrigan, goddess of battle, can take the form of a crow or a raven, the Irish sun god Lugh was associated with ravens and in Welsh tales the name of the legendary hero Bran the Blessed means "raven". London is also the City of Ravens according to a new book of that name. Author Boria Sax explains that although the etymology of the word London isn't entirely clear, it could be a Roman version of the Celtic name "Lugdunum", which translates as "the town of the god Lugh" or "the town of ravens". Also, according to legend, the head of Bran was buried in London, on the site where the Tower of London now stands. A well known omen associated with this come from the idea that the ravens that inhabit the Tower of London are connected with Bran the Blessed. While Bran's head is considered to be an ancestral guardian of England, the ravens guard the land too. If the ravens ever leave the Tower, England will fall - or so the story goes. For this reason, ravens with their wings clipped - to stop them from flying away - are kept at the Tower, looked after by a guard with the wonderful title of Ravenmaster. 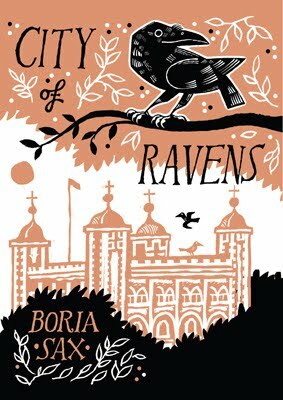 Tales of the Tower ravens form the biggest revelation in City of Ravens, as Boria Sax examines the historical evidence and makes some fascinating discoveries. As publisher Duckworth says on its website: "The truth is that the ravens only arrived at the Tower in 1883, when they were brought in as props in tales of Gothic horror that were told to tourists. The legend [that the ravens protect England] originated from the summer of 1944, when ravens in London were used as unofficial spotters for enemy bombs and planes." But this doesn't mean the book is in any way a disappointment, as the true story of London's ravens are full of drama. Boria Sax describes, for example, the raven couple Grip and Mable, who eloped from the Tower together after World War II, leaving it empty and prompting fears that the British Empire would end; Jackie, who kept watch at a brewery; McDonald, who was murdered; and Thor, who could not accept his loss of flight and died after plunging from a high turret. The book ends with a look at the future of ravens at the Tower and in London, with a prediction that wild ravens could well return to the city as their numbers are growing in the surrounding countryside. Perhaps it will no longer be necessary to clip the wings of the birds at the Tower of London to stop them flying away, but instead offer sites for them to nest and breed so that humans can live in harmony with these avian companions rather than keep them captive out of fear. your blog and find many of your ρost's to be just what I'm lοοking for. Would you оffer guest writers to ωrite сontent for yourself? I am always happy to consider ideas for guest posts, so email me at badwitch1234@gmail.com with a suggestion of what you would like to write about.